Guinea-Bissau recently finished the preliminary round of presidential elections – its first free vote since the military coup two years ago. LAST MONTH I ASKED YOU to please pray for Guinea-Bissau and the country’s upcoming elections. I’m happy to tell you that the elections went smoothly and peacefully – a step in the right direction! The courageous people of Guinea-Bissau went to the polls on April 13 to turn their battered country around after decades of military coups and instability. Despite several reported beatings at the hands of the military in recent months, more than 80% of registered voters showed up to usher in an elected government. 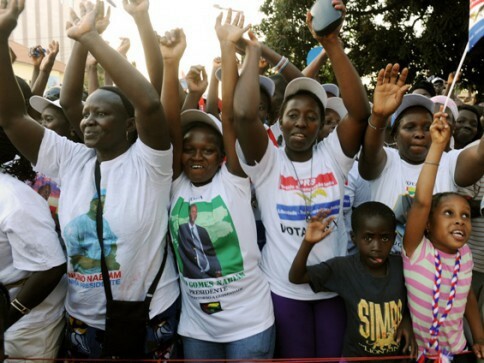 This incredible turnout made a powerful statement: Guineans are ready for change. And we’re ready to work with them to bring about that change – through job skills training, a stronger economy, and the chance at a sustainable future for every family. 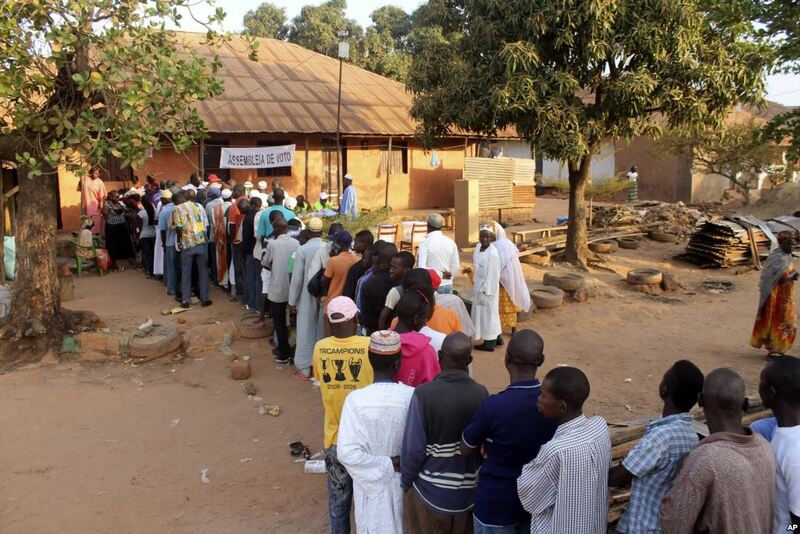 Long lines formed early on April 13 as voters flocked to the polls to bring change to Guinea-Bissau. The two presidential candidates who won the most votes last month, Jose Mario Vaz (who received 41% of the vote) and Nuno Nabiam (who received 25% of the vote), will face a runoff election on May 18. Please pray for a continued peaceful elections process. If you would like to partner with us to help Guinea-Bissau during this critical time in its history, please consider making a special, one-time donation on Tuesday. All donations made through this link on Tuesday, May 6, will be partially matched and stretched further. Thank you again for your ongoing prayers and support. 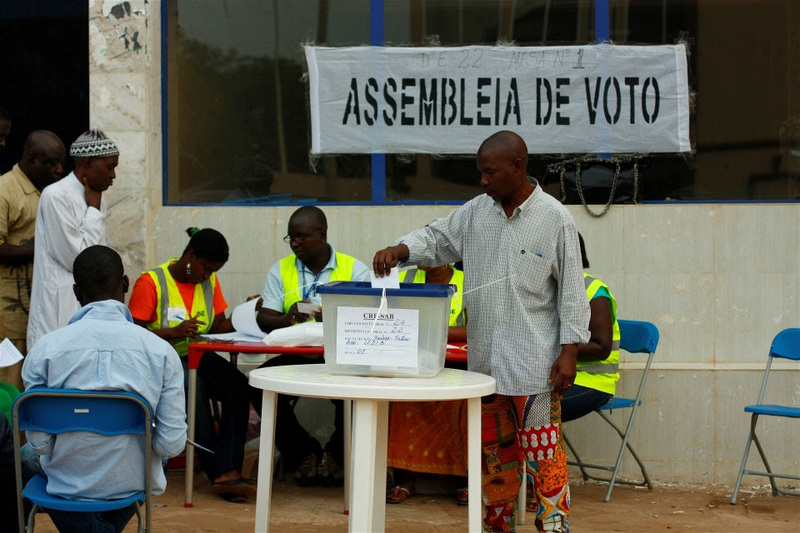 Guinea-Bissau recently finished registering its eligible voters for the upcoming elections on April 13. This is the first time the country has held elections since the military coup two years ago. TWO YEARS AGO WHILE I WAS IN GUINEA-BISSAU, soldiers barged into the home of the country’s prime minister, who was running for president at the time, and took him hostage. They temporarily shut down local radio stations and later propped up a new government – all so that they could make sure that no one interfered with their lucrative role in helping traffic Columbian cocaine to Europe. Guinea-Bissau, one of the smallest and poorest countries in the world, is home to the WAVS School. It’s also famous for its many military coups over the years. Of all the coups, however, the April 2012 coup has been one of the worst. Not since the 1998 coup that led to the country’s civil war has the country suffered so much. The political instability has devastated the already-weak economy. Meanwhile, international donors like the United Nations, who cover half of the government budget, withdrew all their support – which means that the salaries of teachers and hospital workers have gone unpaid. This is all happening in a country where more than two out of three people live on less than $2 a day. That is why I am asking you to pray for Guinea-Bissau. On April 13, there is a real chance for change. Guinea-Bissau will hold its first elections since the coup and the leading candidates are bringing a fresh, new perspective. They are a change from the same old politicians who have dominated the country for the last two decades. But a return to democracy will only happen if the elections go smoothly and the military doesn’t interfere again. Your prayers these next few weeks will be critical. At stake is nothing less than the future of 1.7 million people who call Guinea-Bissau home. THEN there is hope – and unlimited potential for this country. With political stability, the economy will recover. Our students and graduates will have an easier time finding jobs. Families can plan for the future rather than scrape by each day. The WAVS School has already proven that job-skills training is one of the best ways to invest in the long-term development of Guinea-Bissau. The only thing our students need is the chance to put their skills to use. Even in the midst of these challenges, I’m inspired by the resilience of our graduates. Papa Mendes, a 28-year-old graduate of the WAVS welding and metal works course, has started an internship using the skills he learned at the WAVS School. Take Papa Mendes, for example. I met up with him a couple weeks ago at a Portuguese-owned workshop in the rural town of Canchungo, where our school is located. Papa, 28, graduated last year from the WAVS School welding and metal works course. Prior to this training, he had no job skills and no experience in welding. Now, thanks to his new skills set, he is interning at the workshop and hopes he’ll soon be able to work there full time. I’m confident that young people like Papa Mendes can help transform their country – in small ways and big ways. They just need to be given the chance. P.S. If you would like to make it possible for more young men and women like Papa Mendes to learn important job skills, please consider sponsoring a teacher at the WAVS School. Learn more about the WAVS teacher sponsorship program here. Thank you for making the 'Truck for Christmas' campaign a success! Last month, we asked our supporters to pitch in to help purchase a much-needed pickup truck for the WAVS School in Guinea-Bissau. Thanks to their amazing generosity, we exceeded our goal and raised $10,816 from 34 donors. Thank you to everyone who contributed for making the ’Truck for Christmas’ campaign a success so that our students and staff can expand their work in 2014. We greatly appreciate your continued generosity, prayers and encouragement. This Christmas, help make a real difference in the lives of these students and staff at the WAVS School in Guinea-Bissau by giving a very practical, useful gift: a pickup truck. Thanks to a matching donation, every dollar you give will be doubled! Between now and the end of the year, if you give $100 or more toward the Truck For Christmas Campaign, we will send you a hand-crafted bracelet or necklace made in Guinea-Bissau. It makes for a perfect Christmas gift! The WAVS School has long relied on an aging, 1987 Suzuki Samurai to transport goods and supplies. With the growth of the school’s auto mechanics and welding programs, however, the Samurai is no longer sufficient. Help us purchase a reliable pick-up truck that will make it possible for school staff to navigate the country’s bumpy, dirt roads and transport important supplies and equipment such as welders, engines, steel bars, sheets of metal, heavy tools, and much more. Generous donors have agreed to match every donation made toward this campaign until the end of the year – up to $5,000. Please help us raise another $5,000 to match this gift so we can purchase a pickup truck and expand our impact in Guinea-Bissau. Remember, if you give a gift of $100 or more before Jan. 1, you will receive a hand-crafted bracelet or necklace made in Guinea-Bissau. Your gift is greatly appreciated! German Consul Carsten Wille, the special representative from the German Embassy in Dakar to Guinea-Bissau, spent a morning touring the WAVS school in Canchungo. After seeing the progress being made at the school, Carsten and the German Consul agreed to award WAVS a $10,000 grant to purchase heavy equipment for the auto mechanics and welding departments. The WAVS school awarded diplomas to 10 computer course graduates and its first two English course graduates (who successfully completed 2 ½ years of English). Congratulations to these amazing, dedicated and hard-working students! The WAVS ExtraCredit micro-loan program just finished its first year and we’ve got good news! All three borrowers repaid their loans in full and on time. Now we’re bringing you their stories to show how your partnership with WAVS has helped change lives with something as simple as a $500 loan. We’d like to give a special thanks to our partner organization, Give To Grow International, which helped make this project possible! Marcelino sits in front of his small shop while reviewing receipts from his recent trips to neighboring countries. He’s not afraid of taking risks. But in Guinea-Bissau, that can mean losing it all. So Marcelino moved to the island country of Cape Verde in search of a new life as a construction worker. But two years later, with no money in his pocket, he returned home. Marcelino’s story is a common one. In Guinea-Bissau, a tiny and politically tumultuous country where more than two-thirds of people live off less than $2 a day, you have to take risks if you want to survive. Steady jobs and predictable sources of income are a foreign concept. Often, however, the only capital available to take those risks is someone’s life savings. Usually, it’s not enough money to reap a meaningful return. And when things go bad, it leaves families destitute. I met Marcelino, a 28-year-old husband and father, one year ago in Canchungo, a town of about 20,000 people in western Guinea-Bissau where WAVS has established its vocational job-training center. I was working with local WAVS staff to implement a new program called ExtraCredit, which gives local entrepreneurs (which is almost everybody in Canchungo) a $500 loan that they must pay back in one year with interest. Marcelino was one of three borrowers in our pilot project. Last week, I visited him at his shop in the market to find out whether the loan helped. Marcelino, like the other two borrowers, had paid back his loan, plus interest, in full and on-time. Since this was the first time WAVS was experimenting with micro-loans, I wondered how much difference $500 could really make in one year. My doubts rose when I saw Marcelino’s “shop” – the rusted-out remains of the last four feet of a shipping container with two creaky metal doors on either side. Inside, with a few rays of light peeking through holes in the container, I saw pairs of bright pink, blue and green slippers, a few shirts hanging from the container roof, and a cardboard box full of hand lotions and hair extensions. Outside the container were two dilapidated wooden tables that probably would have been used for scraps anywhere else in the world. Marcelino explained that after returning from the Cape Verdean islands in 2009, he rented space in the market for this shop. Earlier in life, he has sold basic goods for six years before his meager profits disappeared with the failed cashew harvest in 2007. “I know this work well,” he said. Despite the fact that his last big investment went bad, Marcelino knew he had no choice but to keep taking risks if he wanted to, for example, finally finish constructing his house in a nearby village. So when he heard about the WAVS ExtraCredit program, he eagerly accepted the $500 loan. With that money, he told me, he made several trips to The Gambia, a neighboring country, and to Senegal’s capital, Dakar, which is a 14-hour drive from here. On each trip, he bought as much as he could and loaded it onto a public transport vehicle back to Canchungo, knowing that with poor infrastructure and political instability in Guinea-Bissau, everything in his home-country costs more than in the better-developed neighboring countries. Hair extensions – which many Guinean women wear – cost $4 in The Gambia and sell for $6 in Canchungo, for example. The $500 loan was just what Marcelino needed to take advantage of the market price differences and help grow his shop. “After all these challenges in my life, this loan really helped me start my business again,” he told me. Because Marce-lino paid back his loan, he’s now eligible for a $1,000 loan from the ExtraCredit program, which he’ll receive in December. Abulai stands in front of his small shop in the Canchungo market. Abulai, a jovial and energetic 23-year-old with a strong handshake and big smile, runs a small shop – brightly painted yellow – with just enough space for him to stand behind the counter. It’s stuffed with baby shirts, baby socks and small toys. He received a $500 micro-loan from WAVS in early 2012 that he used to purchase new items from the capital in Guinea-Bissau and sell them in Canchungo. This gave him the cash he needed to diversify his purchases and find out which products sold well in his hometown. Also, thanks to the increased revenue from sales this last year, he was able to plant rice on his property so that his family didn’t have to buy expensive sacks of rice from the market. “I was able to invest the money in some things that were able to help me a lot,” he said. Cande uses his phone to send cell-phone credit directly to customers. Cande’s shop is a couple hundred yards from the main market, so he doesn’t see as much foot traffic as other business owners do. This has forced him to focus on finding a niche in the market – in this case, selling cell-phone credit. The soap, spaghetti, candles, oil, and bottled water in his shop don’t always sell well. “But I can sell credit quickly,” he said. WAVS awarded Cande, 39, a $500 loan early last year to help expand his business. After repaying the loan in full and on time one year later, WAVS issued him a $1,000 loan in May. He’s already invested that money – purchasing a used motorbike to transport goods and two cell phones that he and his nephew are using to send cell-phone credit directly to customers’ phone. The loan has made it possible for Cande to purchase the phone credit in bulk and at a discounted price so that he can re-sell it for a profit, giving him the money he needs to support himself, his fiancé, and many relatives and friends and his social circle. Recognizing that the WAVS loans are critical to his business’s success in the future, Cande says that he’s determined to continue to repay the loans. “My main goal is to make the loan payment because it’s not my money,” he said. To save a little money, I always take the long way to get here. But sometimes I wonder if it’s worth it. The journey begins in Fresno, California, where I check in my suitcase weighing exactly 50 pounds – the airlines’ limit – and then haul my (much heavier, but smaller) carry-on suitcase through security, stuffed with electronics for the WAVS school, snacks for my journey, and suspicious-looking packets of instant oatmeal. My zipped-tight carry-on always gets searched – something about a bunch of wires and electronic gadgets stuffed next to oatmeal always raises the eyebrows of the TSA agents. Then, after 2 or 3 layovers in the U.S. and Europe, I land in Dakar, Senegal’s capital. (People in Dakar like to think of their chaotic, noisy capital as the Paris of West Africa. But after a couple taxi rides, you start to think of it as the L.A. of West Africa). I usually stay at a cheap guest house for one or two nights, taking advantage of the hot water, air conditioning, and decent restaurants in town. Meanwhile, I make several trips to the airport to see how soon I can get a flight on the infamous Senegalese Airlines to Ziguinchor, a town just north of the Guinea-Bissau border. You can’t buy flights online, so if I’m lucky, the daily flight to Ziguinchor hasn’t been canceled and a seat is still available. Many times, however, the flights are inexplicably canceled – which was the case during this last trip. When I asked the airline representative why it was canceled, she just tilted her head and smiled at me. Once safely in Ziguinchor, it’s another taxi ride hauling my luggage around – the large suitcase, the heavy carry-on, and my backpack – and another night in a hotel. Then, in the morning, I take a taxi to the paragem – a sprawling parking lot of public transport cars and buses. After a lot of negotiating, I squeeze into a Peugot sedan (converted to add a third row of seats between the wheel wells) with seven other sweaty passengers. Then the fun begins. Police checkpoints, customs stops, and baggage searches by the military all turn what should be a 3-hour journey into a 5-hour escapade. There are also the random stops along the way to pick up passengers’ goods – huge sacks of charcoal, bags of rice, and (sometimes) live chickens. This last trip, it was 18 crates of tomatoes – all of them incredibly stacked on top of the car, two layers thick, visibly sinking the car’s roof. It took about 45 minutes in the midday heat to load the produce on the car and tie it down. Myself and two other passengers, realizing after the first few crates were hauled over to the car that this wasn’t going to be a short stop, pitched in and helped load the rest of them. Finally, we were back on our way. Only 2 ½ hours to go. The rest of the drive, if you’re lucky enough to not be squished in the back row, is endurable – and actually very scenic. That’s as long as the car doesn’t break down or its driver doesn’t get into a long argument with customs or military officials. Once, I took five different cars to get from Ziguinchor to Canchungo, un-loading and re-loading my luggage and negotiating a price with each one. So, that’s the long way. The shorter way is flying to Lisbon and then from Lisbon directly to Bissau, the capital. After every trip, I always vow that I’ll take the shorter way next time, but then always end up thinking that I can tough it out and take the long way – and then always regretting it. But not regretting it completely. At least now I know how people travel in West Africa – in bits and pieces, crowded together, sweating together, working together, negotiating their way at each turn, and finally arriving at their destination, ready for a long siesta. I may not always enjoy the hassles of the journey, but I’m thankful for the experience. And I’m even more thankful to be back at my second home in Canchungo – catching up with friends, using my broken Guinea-Bissau Creole, and working with the local staff to carry out ambitious plans for growing and improving the WAVS school. It sure was a long trip here, but it was worth it. NOTE: I especially looked forward to this trip because I was able to attend the wedding of our school director, Almamo Danfa. I took on the role of wedding photographer. It was a packed house at Igrejia Central in Bissau, with more than 300 guests from all over Guinea-Bissau – and West Africa. Click here to see photos from the wedding and join me in congratulating Almamo! Last month, I visited Brissimo at his dusty workshop behind a hotel. He didn’t have much – just a bag of wrenches and screwdrivers. But he had a job. Fresno violinist Patrick Contreras plays his cover of “Hallelujah” while dozens of curious kids from a soccer camp look on in Canchungo, Guinea-Bissau. FRESNO CAME TO GUINEA-BISSAU LAST MONTH. A five-member team spent two weeks in January immersed in the culture of West Africa while helping WAVS with a handful of important projects. The team included four members of The Well Community Church – Madera Mayor Robert Poythress, Well videographer Pat Dill, Well pastor Andrew Feil, and software developer Michael Wanke – as well as Fresno violinist Patrick Contreras. The team learned basic Guinea-Bissau Creole phrases, went on a scavenger hunt, taught in the English classes at the WAVS school, performed a concert in the capital city, installed a computer server, filmed a video about WAVS, shot footage for a music video, cooked and ate local food, spent a “Day in the Life of African Woman,” survived going through countless police and military checkpoints, sampled the cuisine at several local restaurants, played soccer with local futbol players, and had long conversations with pastors, a famous Guinean musician, and journalists. Overall, not a bad way to spend two weeks in Africa. If you’d like to hear first-hand about the team’s experience in Guinea-Bissau, please join us for a special presentation at 7 p.m. this Friday at The Well Community Church’s north campus (2044 E Nees Ave Fresno, CA 93720). Find out more info here. Want to visit Guinea-Bissau in the future? Email us at info@WAVSchools.org to find out more about future trip possibilities. Wanted to let you know we are safe and sound with the Griffiths in Senegal. We had a few hiccups (Patrickdidn’t get his bag and a crazy check-in at Senegal), but we are doing really good. We are about to shower and unwind. We will be going with them to church tomorrow and may do a few other things. But the Griffiths are coming up huge! Next week, WAVS will host a team of four visitors from The Well Community Church in Fresno, Calif., along with Fresno pan-genre violinist Patrick Contreras. We’ve been preparing for this group for the last few months and I’m very much looking forward to their visit. The Well team will be working on two very important projects: 1) a new video that tells the story about WAVS and the opportunities and challenges in Guinea-Bissau and 2) the installation of a computer server to help upgrade our Internet Cafe and computer lab at the WAVS school in Canchungo. Meanwhile, Patrick Contreras will be working on a music video along with Well staff videographer Pat Dill. To put it bluntly, it should be pretty amazing. Fresno rock violinist Patrick Contreras will be visiting WAVS in Guinea-Bissau. To keep tabs on their trip, check this blog often. We’ll be posting several updates during their visit from Jan. 13-25. Kristin Kane, Public Affairs Officer with the U.S. Embassy in Dakar, visits a WAVS school English class on Nov. 8 during her visit to Canchungo. I’m excited to announce that WAVS received its first federal grant last month. The Public Affairs Office of the U.S. Embassy in Dakar awarded WAVS $8,500 to help start the school’s welding program. These funds will help cover the costs of supplies and materials needed for students to learn an important trade that is in growing demand in Guinea-Bissau. The course is taught by an experienced Bissau-Guinean welding instructor and includes both hands-on practical teaching, as well as classroom instruction. Kristin Kane, Public Affairs Office with the U.S. Embassy in Dakar, visited Canchungo for her first time on Nov. 8 so that she could see the school herself. ABOUT 50 SEATTLE-AREA SUPPORTERS OF WAVS attended a special dessert celebration on October 6 for WAVS founders Herb and Martha Reynolds. 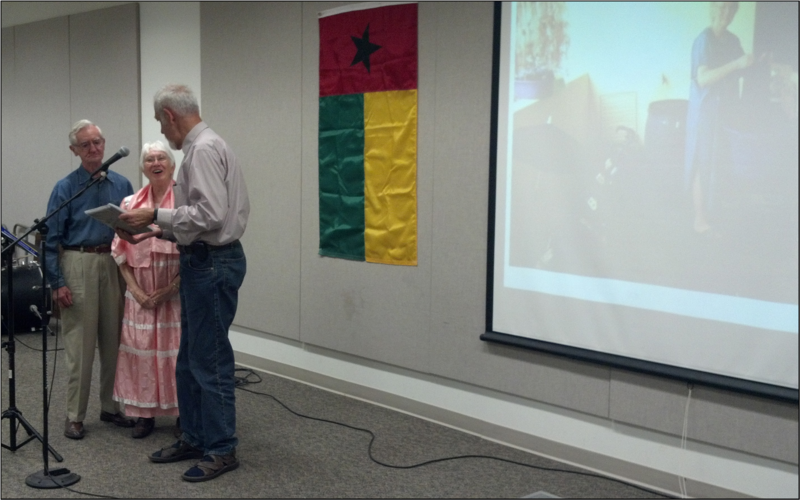 After almost two decades of work in Guinea-Bissau, Herb and Martha are stepping down from their roles as missionaries, though they hope to visit Guinea-Bissau again in the future and remain actively involved with WAVS. To honor their dedication and service, the WAVS board of directors presented the Reynolds’ with the inaugural “Deus I Pudi” – or “God is Able” – Award. Please join me in congradulating Herb and Martha on a job well done! Read the story about the event in the Shoreline Patch. Our six-month computer course at the WAVS school is extremely popular. In our lone computer classroom, we have just 10 computers – and they get used a lot. Each day, there are 5 two-hour classes, beginning at 8 a.m. and ending at 6 p.m. It’s not wonder students in Guinea-Bissau really want to learn how to use computers – it’s a skill that opens up lots of new job opportunities. We need to increase the number of computers in our classroom. We also hope to add more computers to our Cyber cafe – one of the only places in town where students and community residents can access the Internet. To do this, we need your help. Do you have a laptop PC that runs at least Windows XP and is no more than three years old and does not have any major problems? If you would like to donate it to the school, let us know at info@WAVSchools.org. Or would you consider donating $500 so that we can purchase a new laptop that will help serve students and teachers in Guinea-Bissau? You can do that here. (We’re looking for laptops instead of desktops because they are easier to transport and more energy efficient). Thanks in advance for your partnership as we work together to bring hope and opportunity to one of the world’s smallest and poorest countries. 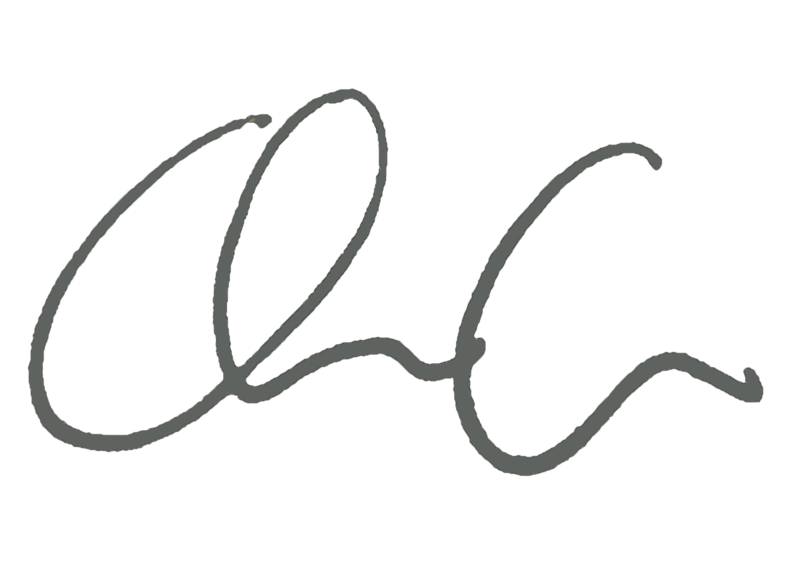 Note: The following was written by Sarah Roche, who visited Guinea-Bissau for four days in May 2012. It was her first time in Africa. As we rode down the tree-lined bumpy road entering Canchungo, my heart skipped a beat as I knew I was in for a real life adventure. I was travelling with my cousin, Dan Byrne, who had not only competed in, but placed and completed the Great African Road Rally in January from Budapest, Hungary to Guinea-Bissau. Dan and three other teammates had pushed themselves beyond all physical and emotional limits with the shared common goal of donating to worthwhile charities focused on education within the Guinea Bissau region. I was fortunate to return with Dan in May as we toured several missions, all involving children and promoting education. Our host, tour guide, and expert interpreter and overall gentleman was Chris Collins, Executive Director of WAVS. Given the limited time we had, Chris ensured we made the most of our time by filling our days with genuine, unique, and meaningful experiences. We toured SOS Children’s Village and it was such a healthy, organized, welcoming campus. One of the first things I noticed was how the children were so happy and well-adjusted. It seemed as though there was a daily routine and the children were very engaged, whether it was time for school, recreation, or household chores. Everyone of all ages was not only pitching in, but smiling as they did their work. When Chris, Dan and I visited a class in session, we were delightfully surprised when the entire class stood and sang in unison in our honor – a heart-warming gesture indeed. As we toured the individual houses, each and every House Mother welcomed us with open arms. They were so proud of the children’s individual accomplishments. What struck me immediately was that not only was every house unique, but very warm and inviting. The children’s drawings and awards were on display. Clearly this was no institution or orphanage – these were homes filled with unconditional love and guidance. Cecelia, the school director, was our tour guide. I was drawn to her sincerity, wisdom, and overall unwavering faith and vision for the students. At the conclusion of our visit, we were blessed to meet her daughters, yet another reflection of her commitment to family and education. I may have made a lifelong friend. Thank you Cecilia! Next we toured WAVS. I was overcome with the students’ eagerness and dedication. It was obvious how much they valued the opportunity to be taking vocational courses. Clearly it was a personal choice, yet these were mature students with specific career goals in sight. Some students shared with us that they view WAVS as a blessing and their bridge to becoming successful in their own right. One student shared he was already trained as an expert tailor, but that learning IT and English will open up endless opportunities in his near future. The classrooms were colorful and airy and both the students and teachers were fully engaged. As a visitor, there is a strong sense of a faith-based message, as well, and that was very inspiring. We were able to visit auto mechanics, sewing, IT, and English classes in session. What I could clearly envision is the overall potential of WAVS as word of it spreads. I want to personally thank Chris, Almamo, Herb and Martha for allowing us to stay in your home. Please seriously consider donating to WAVS via monetary or much-needed supplies. 1 John 3:1 (NIV) How great is the love the Father has lavished on us, that we should be called children of God.